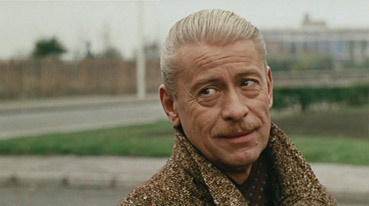 There are two proclamations of intent at the start of Alain Resnais' third feature, Muriel ou Le temps d'un retour [Muriel, or the Time of a Return], both of them cinematic rather than vocal or textual. The first is the music that sits under the opening credits, an off-key, arrhythmic and vaguely experimental piece that seems to signal that the film we are about to watch will be neither upbeat nor straightforwardly told. The second takes place in the opening few seconds of the first scene and consists of a series of close-ups of objects, hands, feet and faces, as a woman's voice outlines her specific furniture needs, the rapid pace of the editing accelerating to the point where the formal rules of scene assembly are effectively thrown aside. Are we being directed to recognise meaning in the content of these shots or is this fractured montage designed purely to invite viewer (mis-) interpretation? It's an intriguing sequence to look back on from a modern perspective, having the cut-up quality of works by William Burroughs and Anthony Balch, and prefiguring, for better or worse, the machine-gun montage of modern music videos, the computer-selected editing decisions of Lars Von Trier's The Boss of it All, and even the frantically jumbled construction of the exasperating action scenes in Quantum of Solace. But then again, maybe I'm reading things into a sequence that has no other purpose than to alert the viewer to further breaks with convention to come. Muriel is a jigsaw puzzle of a film, one whose full picture only becomes clear over time as the pieces are placed and connected. All four main characters are introduced at an early stage, but their relationships to each other are not all they first appear to be. It's established in the opening dialogue that antique furniture dealer Hélène is the mother of recently demobbed Bernard and that the pair are expecting a visit from a man who may be Bernard's father. Except that's not quite the case. While it's true that Hélène was once romantically involved with the visiting Alphonse, she is actually not Bernard's biological mother but his father's second wife. Or so Bernard he tells Françoise, Alphonse's pretty young niece, whom we soon begin to suspect is not his niece at all. Hélène asks Bernard to not criticise Alphonse, but Bernard clearly dislikes the man, staring him down after their first conversation and excusing himself from the dinner table just seconds after they've all sat down to eat. Just what is behind this hostility for a man he's apparently never met before? 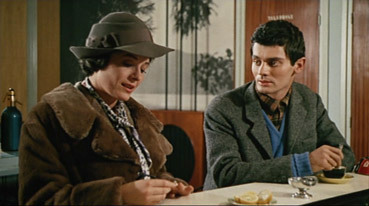 And then there's the Muriel of the title, a Godot-like woman who is repeatedly referred to but never seen, with only small clues provided to her identity and importance to Bernard, at least until until Bernard reveals all to a secondary character, recalling a troubled memory in a film whose characters repeatedly reflect on the past. Muriel is about relationships and generations, about memory and the passing of time. This last aspect in particular is explored not just through the characters and their conversations, but in the structure of the film itself. I can't remember which American filmmaker it was who credited Resnais with teaching him how to compress film time by simply removing non-essential content from a sequence, but it's a sure bet that Muriel was one of the lessons. Repeatedly scenes are shorn of action that serves only to move a character from A to B, an editing style whose mainstream adoption makes it seem less revolutionary and at times almost invisible today, but is nonetheless still deliberately jarring enough in places to prompt the occasional viewer double-take. But midway through the film Resnais takes this to a bold and experimental extreme, as whole months fly by in a matter of minutes, not as a traditional passing-of-time montage but brief single-shot snippets from events in the lives of the main characters. It's almost as if he had shot and assembled a couple of hours of footage and then selected just a few pertinent seconds from each scene to capture its essence rather than its fine detail, an editing style more readily associated with film trailers than the features they are promoting. Once you get the hang of it (when it kicks in you'll likely spend a couple of minutes wondering what the hell is happening), it's a surprisingly effective and informative technique – a two second shot of Alphonse drinking and laughing with the patrons of a bar is all that's needed to establish the level to which he has become involved with and accepted by the community he was originally planning only to briefly visit, while his plans to open a luxury snack bar are catalogued in just five shots, three short lines of dialogue and twenty-four seconds of screen time. At this speed, close attention is required to fill the gaps, and just occasionally you're tempted to wonder if pieces from another two cinematic jigsaws have inadvertently found their way into this one's box. But early night/day switches aside, a chronological path is adhered to, and once you realise that we're not dealing with flashbacks or premonition the timeline becomes easier to follow. 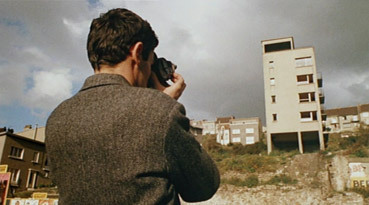 Shot juxtaposition is also used to build subtle links between characters and their experiences, as a conversation between one couple continues under shots of the other, inviting us to explore the connection, if any, between the words and activities of both. Different characters leave buildings or meet up with others simultaneously in different locations or walk the same paths at different times, recalling Bernard and Alphonse's coinciding time in Algiers, the former in military service, the latter running an exclusive café that the younger man would not even have been aware of, let alone have been permitted to enter. All of which must make Muriel sound like an exercise in style over content, but the drama is complex and involving and a good part of its considerable intrigue lies in the convoluted manner of its telling. I will admit a certain cineaste thrill from seeing conventions of editing and scene construction challenged in a manner that still looks adventurous forty-five years on, but I see no problem with that – a good part of what gives any number of major film works their replay value lies as much in the artistry with which they are constructed as with their characters and story. Of course this raises the question of whether Muriel really is the major film achievement that some have claimed or a work that simply gives the surface impression of being so. I have no problem advocating the former argument and offer as evidence the fact that it takes a lot more than clever editing to holding a viewer's attention for 111 minutes straight, and this Muriel most definitely does. An intricately constructed script by Jean Cayrol (who worked previously with Resnais on his compelling holiocaust documentary Night and Fog [Nuit et brouillard]) and a quartet of finely judged lead performances from Delphine Seyrig, Jean-Pierre Kéren, Jean-Baptiste Thiérrée and Nita Klein result in an almost instant engagement with the characters, while the hook of intrigue is provided by the manner in which their stories unfold. Some of the film's mysteries are destined to remain so, but the central narrative is more clearly defined and concluded, and more emotionally involving, than the more dreamlike Last Year in Marienbad [Année dernière à Marienbad], the director's previous and probably most celebrated work. Like that film, Muriel is in part a study in time and memory, of a present shaped largely by recollections of the past (and I say that in spite of Resnais' own rejection of the term 'memory' in relation to his work, quoted in booklet accompanying this DVD), but one in which in which the mechanics of a relationship drama are re-imagined through avant-garde eyes without compromising the integrity or cinematic appeal of either. You'll need to play close attention and probably watch the film at least twice to connect the dots, but the rewards for doing so are there aplenty. A reasonably solid anamorphic 1.78:1 transfer that has apparently been slightly cropped from a 1.66:1 original, but whose mastering was supervised by Resnais, who expressly forbade any digital restoration work or enhancement. The image is a touch shy of what we've come to expect of DVD sharp and the colours sometimes have an aged look, being a little faded and having a sometimes brown/green hue, though the odd prime colour is vivid enough. The contrast is consistently good, though, with only occasional loss of shadow detail, and dust spots are rare. A clear enough mono soundtrack with no obvious distortion issues, but there is a slight background hiss and the occasional pop to contend with here and there. Nothing distracting, though. A little light for an MoC disc, this one does feature the Original Trailer (3:43), an interesting construct that plays on the mystery surrounding the characters and their past lives, and a typically well produced Booklet, which contains a a detailed but not always reader-friendly essay on Resnais and this film by B. Kite, a more accessible one on the same by Anne Thorngate, an engaging collection of brief interview snippets called The Muriel Scrapbook, a brief 1966 piece by Hnery Langlois entitled It Was in Venice That You Had to See Muriel, and a reproduction of a letter from Alain Resnais requesting that no changes or enhancements be made to the film's colours or soundtrack. Art and entertainment meet and get on fine in Alain Resnais' third feature, which is as technically bold as it is dramatically compelling. I'd need another couple of viewings to really get to grips with the intricacies of the character and plot detail, but I was hooked from the first few minutes and genuinely startled by the film's adventures in editing. The transfer on this Masters of Cinema disc is likely as good as the film is going to look and sound given Resnais' refusal of restoration work beyond a print clean-up. The disc is light on extra features, but it's probably the least widely seen of the director's early work and is thus still a welcome release.